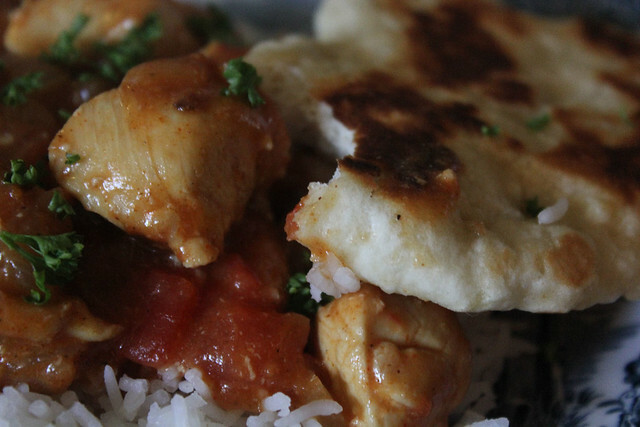 When I make curries or like tonight, for the Chicken Tikka Masala, I always pair it with some Naan bread. 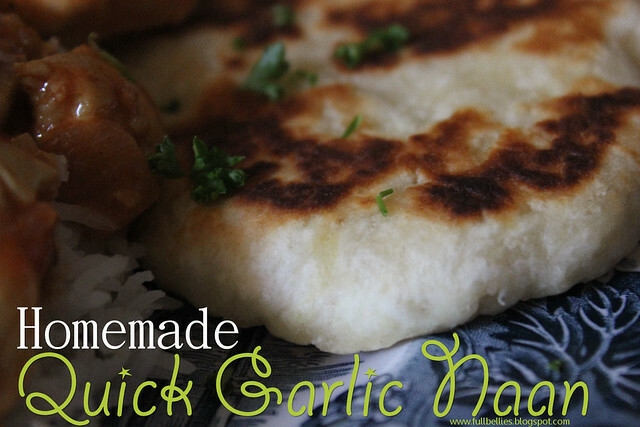 Usually I'll buy it premade but last year I came across a recipe for some quick homemade Naan and since then I have not bought from the store. The recipe doesn't make many at all, matter of fact first time I made it, I ended up with just 4 small Naan's and we do love our Naan so the next time I tried it, I tripled the recipe. The recipe comes from The Fresh Loaf, and she says that for each cup of flour you get 3 or 4 naan, depending on the size of your tawa or skillet. In a large bowl, mix dry ingredients together. Add 3tbsp yogurt and a little water if needed. Knead in the bowl until smooth and cover for 30 minutes. Preheat the tawa or a heavy skillet on medium high heat. 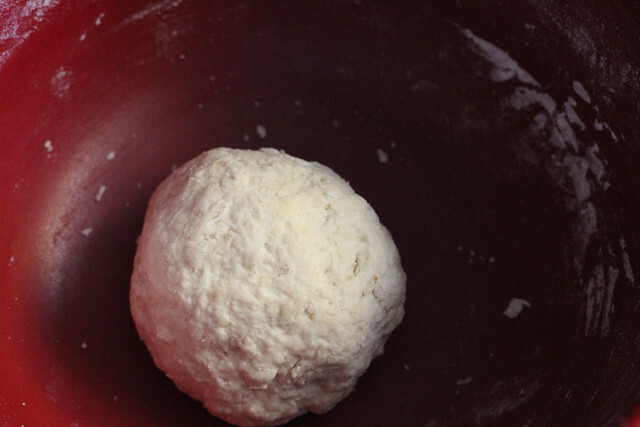 Divide your dough and roll in to balls. For a 12" tawa, you will get 3 pieces of naan per cup of flour. Roll on a lightly floured surface to approximately 1/4" thick. Dust off any excess flour and place on the hot tawa or skillet. Optional- brush the top side with ghee (clarified butter) or oil. This recipe works perfectly well without the added fat but butter is tasty and it'll give you a crisper naan. When bubbles begin to form (10 to 20 seconds), flip and use a clean, folded dish towel to constantly rotate the naan so it doesn't burn. It may puff up like a pita. Flip once more after a minute or less once you have browning on one side and repeat the rotating until done. Best enjoyed shortly after making. Dough balls will keep in the fridge for a couple of days. Hi, thank u fir this great & easy recipe. I literally just finished eating it & had 2 thank u cuz I was going crazy for easy quick bread like this one. It was fluffy & amazing. I just added 1/4 cup more flour cuz it was too sticky. (I may have used a tad more yogurt, I used a cup which is 105 grams). I also baked it in the oven instead of on the stove & it turned out like pita bread. Soooo yummy, thanks a million.